Escape de las multitudes en un crucero de Milford Sound a bordo de un barco espacioso con un número limitado de pasajeros. Disfrute de la vista de cerca de los lobos marinos de Nueva Zelanda, delfines y pingüinos de cresta de Fiordland desde el lujoso lounge en la cabina superior, donde podrá disfrutar de café, té y galletas de cortesía mientras escucha la narración del patrón. Este barco boutique ofrece una experiencia superior con recuerdos inolvidables de destacados como Mitre Peak. Escuche el comentario en vivo del patrón. 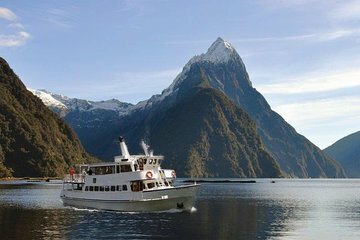 Este crucero de Milford Sound utiliza un bote más pequeño y menos concurrido que la mayoría de los tours, para que pueda acercarse a la vida silvestre. We drove into Milford Sound from a Queenstown. This cruise was a great experience. The staff was friendly, the captain pointed out great details, we would definitely recommend to anyone! Excellent trip. Wonderful and knowledgeable staff. Went with a group of 16 people and had an amazing time. The captain was knowledgeable and hence the commentaries were good. Great sceneries, saw seals and dolphins too. It was extremely enjoyable. Great boat and crew - as described - not overpacked which really helped with moving around the boat and being able to take pictures. This was a fantastic experience. Im so glad we took the time to drive to Milford Sound to do this. This was one of the smaller boats but we enjoyed it more than we would have liked the huge boats with tons more people. We had plenty of room to walk around and get beautiful photos. Excellent value! Loved this smaller boat cruise, the staff were excellent as was the coffee. Got up really close to the awesome waterfalls. Highly recommend choosing this cruise. We were very glad that we chose to cruise Milford Sound on this less crowed smaller craft. With only 24 passengers on our cruise there was ample room to move about either deck and the many open areas for viewing and photo opportunities of which there are many. The captains commentary was very informative including occasional person explanations from the roving deck hands. The mountainous scenery and waterfalls are spectacular.